While I’m lucky enough to be fairly up to speed on a lot of what’s happening in the world of translated fiction, it’s impossible to cover everything, and there have been many times when I haven’t got around to trying a book others read years ago. 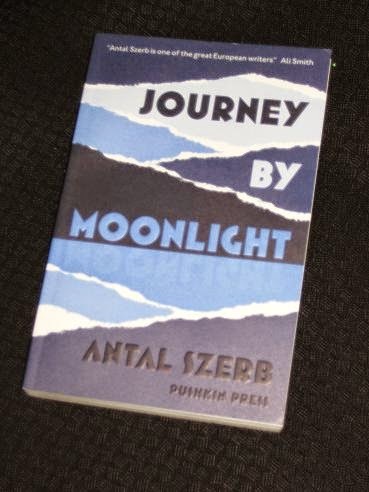 One of those much-praised writers is Hungarian author Antal Szerb, another of those European writers whose reputation Pushkin Press has been trying to restore in the Anglosphere, and the book which has won most praise is his novel Journey by Moonlight. So, having got there at last, will I be adding my name to the long list of admirers? He’s finally made it to Italy because he believes he’s ready to settle down, but it’s very unlikely to happen – Mihály is a dreamer incapable of knuckling down to a steady work life. We soon learn that the roots of his issues lie in the events of his youth, part of which he spent with a group of rather unconventional friends. The doomed depressive Tamás Ulpius and his beautiful sister Éva, the criminal János Szepetneki and the religious Ervin (later to become a priest) – it’s a fascinating group of people, but not one likely to accept the rigours of the nine-to-five. Mihály’s flight to Italy is an attempt to detach himself from the group’s influence. Sadly, it turns out that he can’t get away from them, and in a well-plotted story, it all comes full circle. I enjoyed the occasional comic scenes, such as Mihály’s entanglements with Millicent, a rich American art student, and his talks with a *very* English doctor, and these detours prevented the book from slipping into darkness, despite the serious nature of some of the events. This sounds excellent. I've got it but always forget about it. It's a great discovery, isn't it, and, although you comment on coming to it late, it does mean there's plenty more Szerb available.